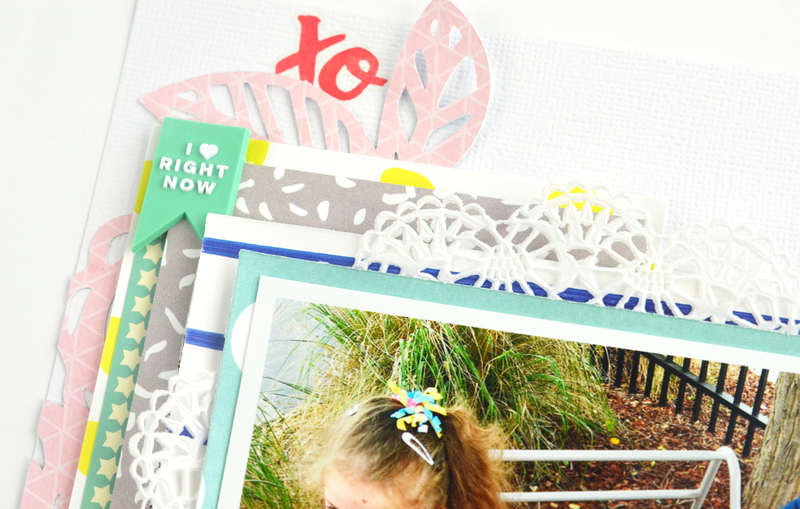 I'm here today with a new layout using the April Kits. 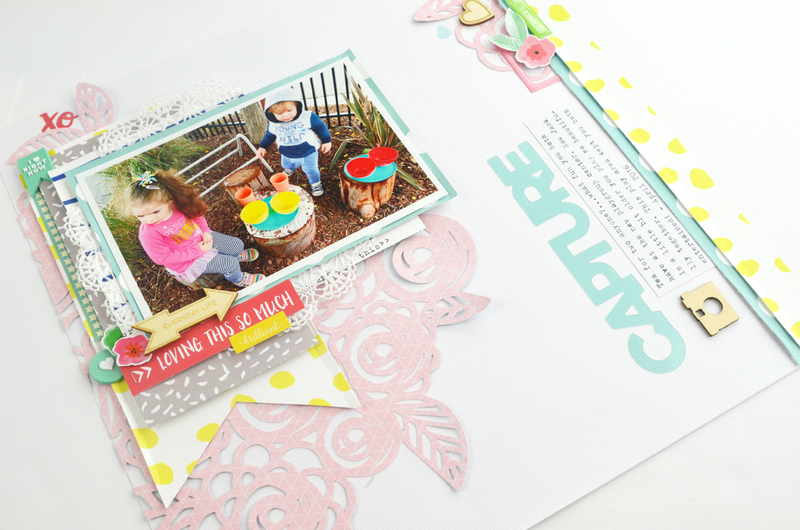 For this layout I decided to revisit that beautiful floral cut file from the March kits by Ashley. I just love it and I had only used it once before. That is what I love about cut files; you can adapt them and enlarge them and use them over and over again and your pages will look different. I took this photo of my kiddies at the playgroup we attend every Tuesday and Wednesday morning. 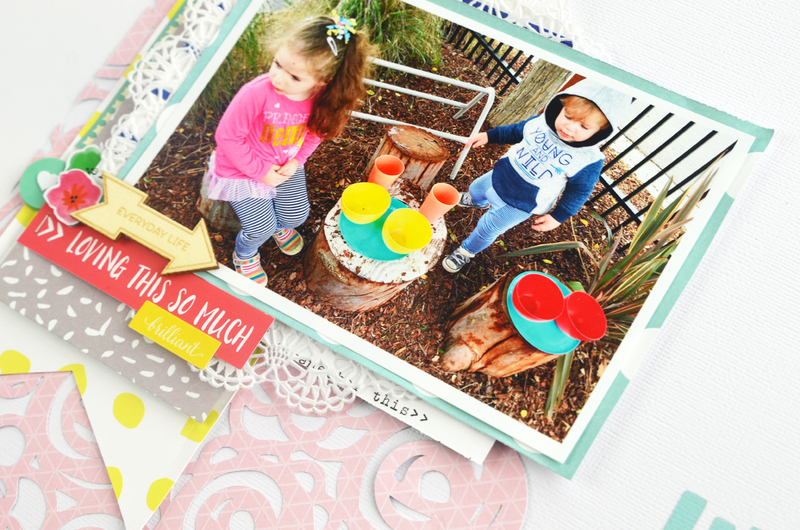 Since Jack has gotten a little bit older he and Charlotte are playing together so beautifully and I wanted to document that on this layout. The playgroup had moved to a new location and this time it came with an outdoor play area with lots of natural materials. They just have a ball. I love the pop of colour this photo brings too and the unposed element of the photo. 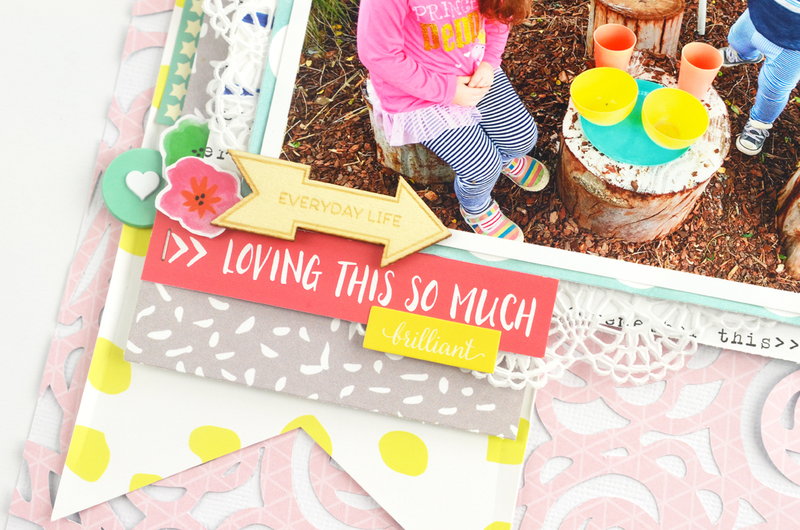 I created a lot of layers behind my photo using the Hip Kit exclusive papers and the Elles Studio Little Moments papers. 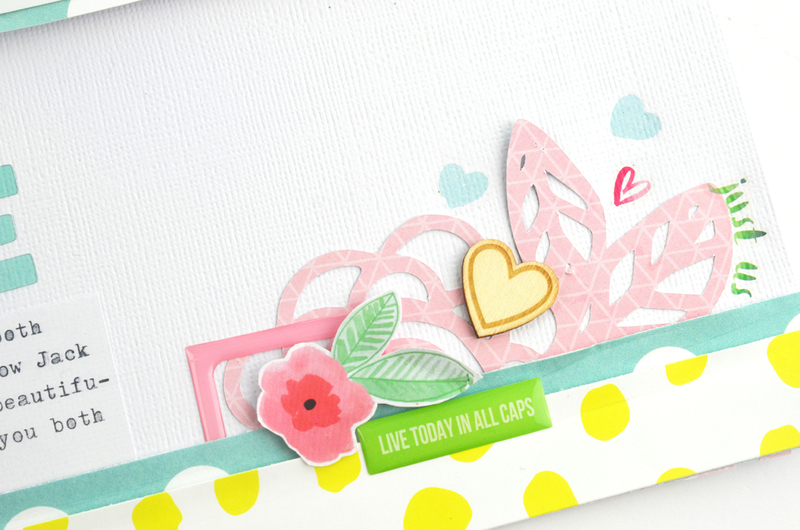 The actual die cut flower piece is cut from the Amy Tan Better Together camera piece which had that gorgeous soft pink print on the b-side which I adore, you know me - I have a thing for pink and soft toned colour palettes! The 'loving this so much' tag is cut from the exclusive Hip Kit cut apart sheet. At the top of the layout to add a little bit more detail I added one of the Pinkfresh Studio Life Noted rubber charms and a xo rub on from the Amy Tangerine Better Together collection. And of course a doily from my stash! I added a touch of wood veneer to my layout from the My Mind's Eye packet and also the Simple Stories wood veneer packet. I added one piece of veneer to each of the three clusters or groupings on my page. The actual photo layer is adhered to my page with a foam sheet to add some dimension. 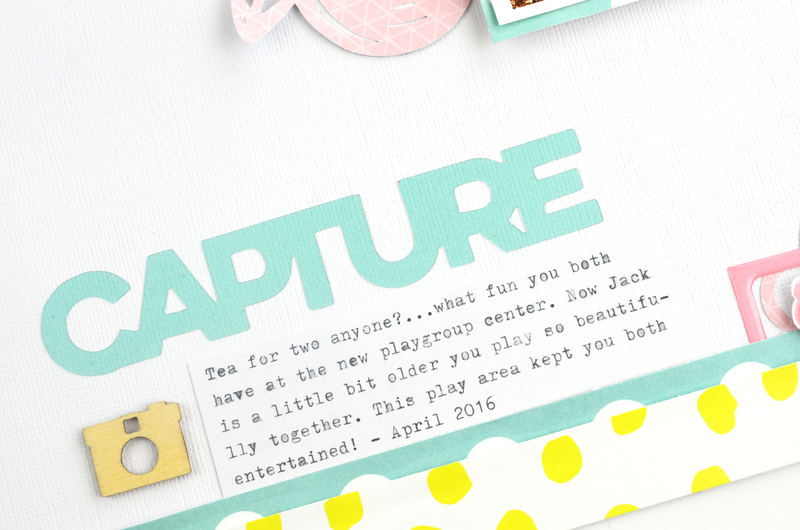 These acetate word packs from Pinkfresh Studio are just amazing! I decided to test out my vellum adhesive spray on it to attach it to my page. The result was fantastic, so I will definitely be doing that again. I could not see any adhesive anywhere, winning! I typed my journaling in a block using my typewriter. To get my journaling to sit the exact part I wanted I drew measurements on my white card stock so I knew I had to type within those boundaries. I created a vertical strip to right of the page as I felt the page needed some weight there. I also added some of the remaining cut file that I had cut off the other side of the page and created a cluster with a mixture of Pinkfresh Studio epoxy frames, Amy Tangerine Rub ons and the wood veneer from My Mind's Eye. Like my page last week, I added the rub on to a piece of white card stock first to create a bit of a die cut. I love the crisp white border it gave the flower too.